AUGUSTA, Ga. — Welcome, friends, to the greatest comeback in sports history. 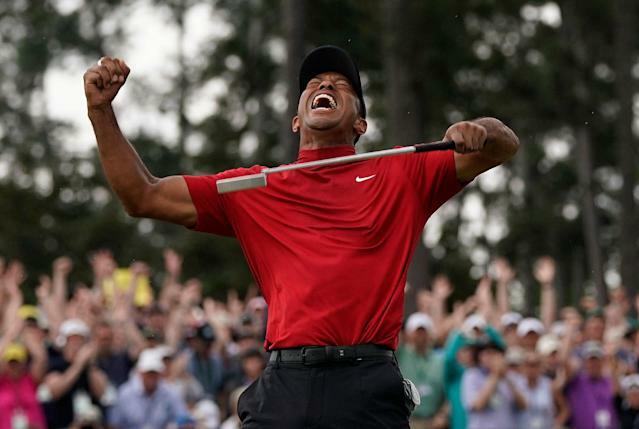 After all the scandals, all the injuries, all the surgeries, all the drama, all the he’s-done declarations, Tiger Woods has won the Masters. In 2019. Nearly 11 years after his last major victory — the longest drought in golf history — Woods won the Masters by one stroke with a bravura 70 final round, keeping his head while the best of the next generation of golfers lost theirs. Six golfers held at least a share of the lead over the day, five tied with only a handful of holes left. But as it was in 1997, so it was 22 years later: Woods walking off the 18th green to delirious cheers, another green jacket awaiting him — his 15th major win in total. “Tiger! Tiger! Tiger!” the crowd around 18 yelled, a comeback complete. The win brought an emotion rarely seen from Woods, who threw up his arms in triumph, unable to wipe the smile off his face. A fist pump. A scream. A massive hug from his son Charlie, who wasn’t born the last time Tiger won one of these. It was total euphoria at Augusta National. With all due respect to the vast talents of Brooks Koepka, Francesco Molinari et. al., there are two storylines at every Masters: Tiger Woods, and everyone else. That’s not media bias or wishful thinking, that’s objective reality. Tiger draws the largest and loudest galleries, Tiger pulls in the biggest ratings, Tiger summons cheers at Augusta that don’t sound like anywhere else on earth. The difference in 2019 as opposed to recent history is this: Woods arrived in Augusta with his first legitimate chance to win in more than half a decade. He’d missed three of the last five due to health reasons, and he’d been irrelevant in the other two. Now, though, he’s as golf-ready as a 43-year-old can be, with another PGA Tour win in his pocket since last year. Woods remains the biggest story in golf, but not the only story. Koepka is riding a Tiger-esque majors hot streak — two of the last three, three of the last seven — and Molinari has punched Tiger in the face while winning both the British Open and the Ryder Cup over the last nine months. Thursday began under one of those classic Augusta skies, blue and deep and breezy, with the gallery buzzing and the birdies flying. This was one of those “future of golf” days, where Koepka and mad scientist Bryson DeChambeau took the early lead at -6. Right behind them: Phil Mickelson, Dustin Johnson, and the usual collection of leaderboard cameos. Molinari and Woods lurked further down the leaderboard at -2. Then came Friday, which was without question one of the strangest days in recent Masters history. Big names came out firing, and by the day’s end an unprecedented five major winners — Molinari, Koepka, Louis Oosthuizen, Adam Scott and Jason Day — shared the lead at -7. But we expected all that. What we didn’t expect was an enthusiastic security guard becoming part of Masters lore by slipping and sliding right into Woods’ ankle while trying to hold back a vicious Augusta gallery. Woods hobbled for a moment but ended up birdieing the hole, and CBS promptly memory-holed the footage. Saturday was King Kong, Godzilla and Mothra all elbowing for space, with Tony Finau sneaking in there amongst them. Molinari, who once caddied next to Woods at a Masters, put distance between himself and the field with the relentless, mechanical precision of an avalanche. Woods and Koepka kept pace, and Finau snuck in with one of the three 64s on the day. With ugly weather on the way, Augusta National moved tee times up — way, way up — almost six hours earlier than normal, splitting the field into two and tripling up the pairings. So there wasn’t much time to meditate on what a Masters Sunday with Tiger Woods in sight of the lead might mean to history before the leaders teed off. Early on, Molinari seemed invincible, running his par streak to 49 holes and, as of the sixth hole, posting a three-stroke lead on the field. Molinari’s dead-eyed stare and clinical perfection — plus the fact that he had history against Woods — seemed to bode well for his chances, and ill for everyone who wanted to see Woods win his first major since 2008. But then Woods nearly drained his approach on 7, Molinari bogeyed for a two-shot swing, and the door cracked open just a wee bit. Five holes later, Molinari put a shot into the drink on 12, and everything on the course turned sideways in a hurry, from the leaderboard to the skies. Molinari’s shot into Rae’s Creek, fired just as the rain was starting to fall, dropped him into a tie with Woods, who played it safe on 12 and went for dry land rather than a risky shot at the pin. But the misfire also kicked the door wide open for a host of unlikely leaders, including Xander Schauffele and Patrick Cantlay. Golf Twitter virtually ignited for the three minutes or so that Cantlay eagled 15 and grabbed the solo lead at -12. He promptly gave back the lead on the very next hole, but it was a nice run for a moment. A couple strokes down the leaderboard, a horde of last-minute dive-bombers threw red numbers up on the board, trying to force their way into the green jacket conversation; Dustin Johnson, Rickie Fowler, Bubba Watson, Jon Rahm and Day pounded their way into double-figure below-par scores. Day was the first one to the clubhouse, posting a mark of -11 after a clutch birdie on 18. At the time he finished, two players were tied with him and three sat one stroke ahead. But Day’s clubhouse lead grew flimsier by the minute. Johnson birdied 17 and Koepka birdied 15 to join Woods, Schauffele and Molinari at -12. Again: that’s four major winners — and Xander Schauffele — tied at -12 with four holes left to go in the Masters. If this wasn’t the greatest collection of talent ever to top a leaderboard this late in a major, it’d do just fine until someone came up with one. And then the wheels started coming off. Molinari was the first to go, sending his hopes to a watery grave when he popped his approach on 15 off a branch and into the water. Fowler’s home-run swing fell just short, and he bogeyed the 18th. Johnson just skirted a birdie putt to finish at -12 and knock Day out of any chance at a playoff. Woods, meanwhile, took the solo lead at the Masters with three holes to play after a smooth birdie on 15. He followed that with the second-best shot he’s ever pulled off at the 16th, a curling drop that left him inches for birdie. Two-shot lead. Two holes to go. And all of a sudden it was the early 2000s again, Tiger Woods in red, walking down the fairway at Augusta after a perfectly striped tee shot, the gallery on its feet cheering him. The figure that Koepka, Schauffele, Jordan Spieth, Justin Thomas and so many others had admired as kids was here, stepping out of Golf Channel reruns to bust them down the leaderboard. The last time Tiger won a major, his daughter was about to turn 1, his son not even born. Sunday, both were greenside to witness something they’d only ever heard about. 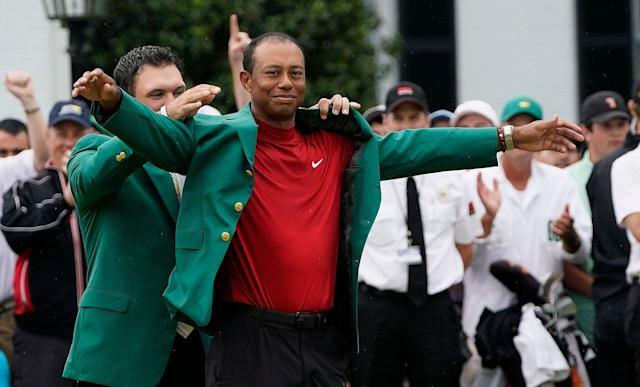 At 43, Tiger Woods became the second oldest winner of the Masters, behind Jack Nicklaus.